This short tutorial explains what AutoSum is and shows the most efficient ways to use AutoSum in Excel. You will see how to automatically sum columns or rows with the Sum shortcut, sum only visible cells, total a selected range vertically and horizontally in one go, and learn the most common reason for Excel AutoSum not working. 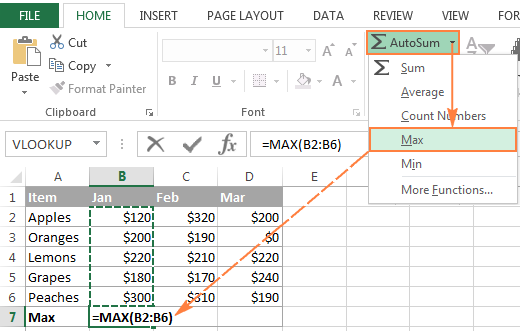 In essence, Excel AutoSum automatically enters a formula to sum numbers in your worksheet. For more details, check out the following sections of this tutorial. Where is AutoSum in Excel? Where is the AutoSum button in Excel? The AutoSum button is available in 2 locations on the Excel ribbon. Whenever you need to sum a single range of cells, whether a column, row or several adjacent columns or rows, you can have Excel AutoSum to automatically make an appropriate SUM formula for you. To sum a column, select the cell immediately below the last value in the column. To sum a row, select the cell to the right of the last number in the row. Click the AutoSum button on either the Home or Formulas tab. In most cases, Excel selects the correct range to total. In a rare case when a wrong range is selected, you can correct it manually by typing the desired range in the formula or by dragging the cursor through the cells you want to sum. Tip. To sum multiple columns or rows at a time, select several cells at the bottom or to the right of your table, respectively, and then click the AutoSum button. For more details, please see How to use AutoSum on more than one cell at a time. Pressing the Equal Sign key while holding the Alt key inserts a Sum formula in a selected cells(s) exactly like pressing the AutoSum button on the ribbon does, and then you hit the Enter key to complete the formula. AVERAGE - to return the average (arithmetic mean) of numbers. COUNT - to count cells with numbers. MAX - to get the largest value. MIN - to get the smallest value. All you need to do is select a cell where you want to insert a formula, click the AutoSum drop-down arrow, and choose the desired function from the list. 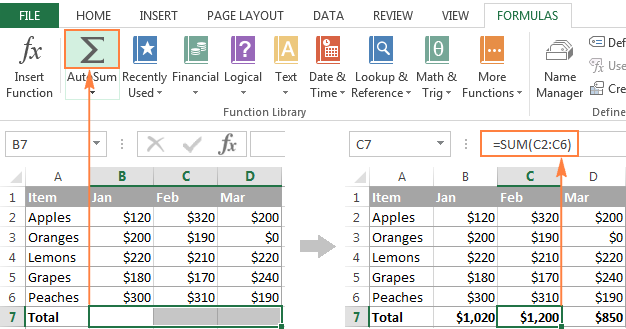 If you select More Functions from the AutoSum drop-down list, Microsoft Excel will open the Insert Function dialog box, like it does when you click the Insert Function button on the Formulas tab, or the fx button on the Formula bar. 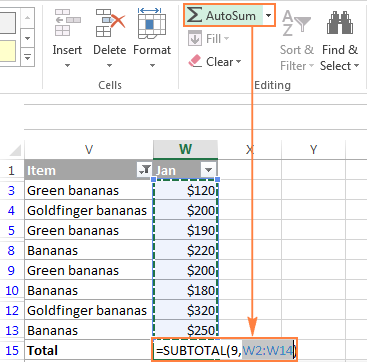 You already know how to use AutoSum in Excel to total a column or row. But did you know that you can use it to sum only visible cells in a filtered list? If your data in organized in an Excel table (which can be easily done by pressing Ctrl + T shortcut), clicking the AutoSum button inserts the SUBTOTAL function that adds only visible cells. For more detailed explanation of the SUBTOTAL function arguments, please see How to sum filtered cells in Excel. 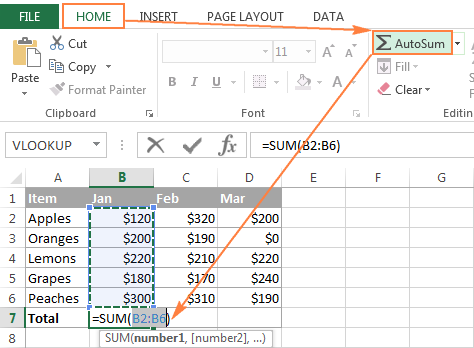 How that you know how to use AutoSum in Excel to automatically add cells, you may want to learn a couple of time-saving tricks that could make your work even more efficient. If you want to sum values in several columns or rows, select all the cells where you want to insert the Sum formula, and then click the AutoSum button on the ribbon or press the Excel Sum shortcut. Once AutoSum has added a SUM (or other) function in the selected cell, the inserted formula behaves like a normal Excel formula. Consequently, you can copy that formula to other cells in the usual way, for example by dragging the fill handle. 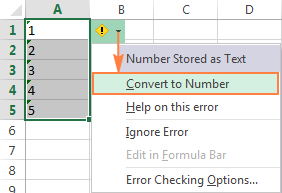 For more information, please see How to copy a formula in Excel. Just keep in mind that Excel's AutoSum uses relative cell references (without $) that adjust to the new formula location based on the relative position of rows and columns. For example, you can have AutoSum to insert the following formula in cell A10 to total the values in column A: =SUM(A1:A9). And when you copy that formula to cell B10, it will turn into =SUM(B1:B9) and total the numbers in column B. In most cases, it is exactly what you need. But if you want to copy the formula to another cell without changing the cell references, you'd need to fix the references by adding the $ sign. Please see Why use $ in Excel formulas for full details. The most common reason for AutoSum not working in Excel is numbers formatted as text. At first sight, those values may look like normal numbers, but Excel regards them as text strings and does not include in calculations. The most obvious indicators of numbers formatted as text are their default left alignment and little green triangles in top-left corner of the cells. To fix such text-numbers, select all problematic cells, click the warning sign, and then click Convert to Number. Numbers can become formatted as text because of various reasons, such as importing a dataset from an external source, or enclosing numeric values in double quotes in your Excel formulas. If the latter, neither green triangles nor the warning sign will appear in cells, because Excel assumes you want to output a text string on purpose. But the returned 1's and 0's are text values, not numbers! And therefore, when you try to do AutoSum on cells containing such formulas, you will always get '0' as the result. As soon as you remove "" surrounding 1 and 0 in the above formula, Excel AutoSum will treat the outputs as numbers and they will be added up correctly. If text-numbers are not the case, you can learn about other possible reasons in this tutorial: Excel SUM not working - reasons and solutions. 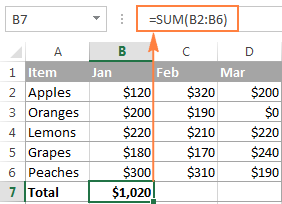 Apart from the common SUM function, did you know that Excel has a couple of other functions to conditionally sum cells? If you are curious to learn them, check out the resources at the end of this page. I thank you for reading and hope to see you on our blog next week! 18 Responses to "How to use AutoSum in Excel"
I have just typed a price list of are different mobile homes. Now i need to add 15,000 euros to each individual price, can this be done on Exel? I am using an Macbook Pro. If this can be done how do i do it? Tried to do it many times with formulas but no success. Supposing you have a price list in column A beginning with cell A2. Then, enter this simple formula =A2+15000 in, say B2, and copy it down to other cells in column B.
Hi Svetlana, I hope you are well. what formula should I use that would minuse 3 from the value in N32 when I add 1 to O32? I'm new to excel. I am having trouble trying to add up a row. The problem is that i want to include a letter after the numbers but it comes up with error because of the letter. SUM/AutoSum perform mathematical calculations with numbers only. They can't interpret your letter as a number, resulting in error. What you can do, is to sum up the numbers only and then enter you letter manually right beside your result figure (if it's a single letter you want to see, of course). If you have lots of numbers with letters, you can use our Cell Cleaner to remove the text from the cells for further calculations. The last resort would be a special script, but we can't help you with it. However, you can try and ask around on MrExcel forum. I am trying to auto sum, a specific value to each cell in that column. For example, I have an "x" in column B2, B3, B4, and B5. In B6, I want it to automatically populate "8", scoring each "x" as 2 points. If I remove the "x" from B3, the scoring should automatically go down to "6" in B6. What formula should I be using so that this happens? Also, I want to color code red a cell, when an "x" is put in both column B2 and C2 within the same row. Each row should have only one "x". If you don't know how to create and use conditional rules, please take a look at our tutorial. Do you want to count the number of entries or sum the numbers to the left of the "CM"? Alt+=, shortcut for autosum is not working. Pressing = while alt is on hold is zooming the screen. I have entered =SUM(H:H) into J2, expecting J2 to show a running total of everything entered into col H. This seems to work for values that are already in col H but does not update when I enter new values further down col H. How do I get J2 to show the "live" value of column H automatically each time something new is added to col H? Most likely it's because your Calculation setting has been changed to Manual instead of Automatic. To fix this, go to the Formulas tab > Calculation group, click the Calculation Options button, and select Automatic. How do I autosum only numbers in bold in a column? Unfortunately, it is not possible to sum only the bold cells using the standard Excel functions. Most likely you need a special macro. I am really sorry we can’t help you with this.